Wow your little ones with this stuffed summer squash blossom recipe! The squash blossoms help to create a really pretty dish, but it will be so fun to make alongside your kiddos with this very easy and hands-on recipe. 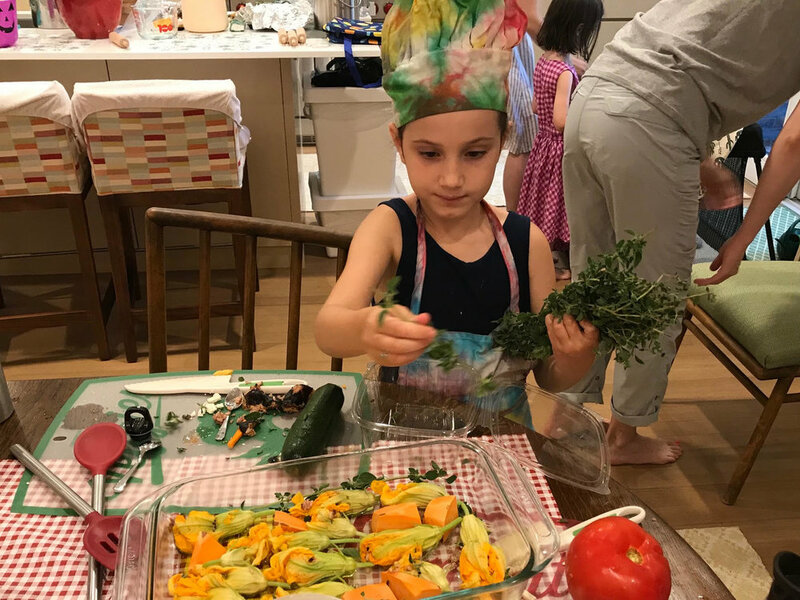 Stuffed squashed blossoms are a traditional Cretan dish that I discovered while on a trip to Greece, and after loving every bite of them, I knew I had to try this recipe with my mini chefs at cooking camp. In the camp, we "traveled" to a different country every day, and this dish was a part of the menu for Greece! We made Greek fry bread stuffed with feta and herbs, souvlaki, and these stuffed squash blossoms. Luckily, squash blossoms are in season right now and I was able to pick up these up at my local farmers market. They can really be stuffed with anything, but this recipe incorporates lots of veggies and rice in a really fun way. 10-15 Squash blossoms (the blooms from summer squash). I purchased these at my local farmers market. Bring water to a boil 2 to 3 cups of water and the salt. Add rice and boil for about 15 minutes, stirring occasionally. Drain. Refrigerate if it will be more than a couple of hours before you use it. While rice is cooking, grate tomatoes and onions and place them in a boil. Add salt, pepper, thyme and 1 tablespoon of olive and stir to combine. Peel potato and quarter. This will help keep the squash blossom soft and moist (these bake along side, not inside). When the rice has cooled, add into the onion tomato mixture. Peel back the petals and stuff with the filling. Place in a pyrex baking dish alongside potatoes. Top with olive olive and salt. Bake for 30-40 mins until tender and rice is cooked through. Top with feta cheese.